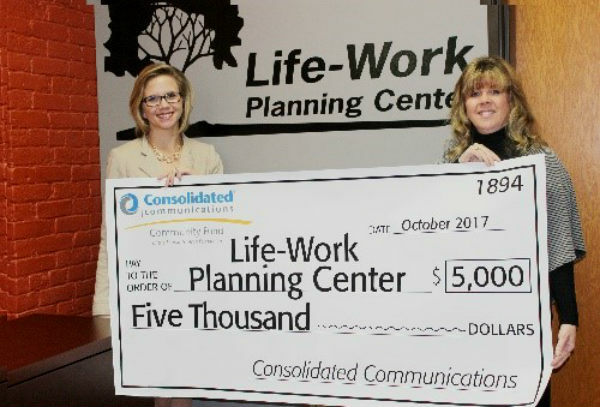 Thanks to the Consolidated Communications Community Fund of the Mankato Area Foundation, Life-Work Planning Center received $5,000 in funding to provide services to women in transition. Life-Work Planning Center is a 501(c) 3 non-profit established in 1979 as a Minnesota Displaced Homemaker Program and a Pre-Employment Program for Women in Transition. The mission of the agency is to increase the emotional and economic self-sufficiency of women and their families. The beliefs driving this mission are that when women are empowered to be self-sufficient they have a stronger sense of well-being and are more able to develop and access the resources to meet their basic needs. Life-Work Planning Center is the only pre-employment program in the Region Nine Area designed specifically to meet the unique barriers of women in transition and displaced homemakers. We are available to help residents throughout Region Nine. The mission of the Consolidated Communications Community Fund is to support initiatives benefiting people and communities in the Company’s southern Minnesota service area, with a focus on K-12 education and critical community needs.